Two days before her 17th birthday - which included big dinner plans and a day trip to Six Flags Discovery Kingdom - my daughter and I were looking for something fun, unique, inexpensive and low-key to do together. Just the two of us. Although we couldn't figure out what we wanted to do, we knew what we DIDN'T want to do: A) sit at a restaurant overindulging in delicious (but unhealthy) food, B) sit in a movie theater for 2.5 hours unable to chat as I stuff my face with an entire large bag of popcorn, C) engage in any kind of physical/outdoor activity that added onto our already really active lifestyles & jobs. The solution? Petroglyph! The paint-your-own ceramic studio lounge is located in our old Willow Glen neighborhood. It had been 5 years since she and I painted pieces there, and we thought this would be the perfect way to spend quality time together doing something fun and creative. A studio day pass is $9.75 per adult. The pass covers all supplies, support, glazing and kiln firing. In addition, you pay for each piece(s) you'd like to paint. The day pass allows you to come and go as you please. Grab lunch and bring it back to enjoy here. If you don't finish today, you can take your piece home and return to finish without paying another studio fee. Perfect! After browsing hundreds of unpainted pieces, Starlight fell in love with the crown box and knew exactly how she wanted to paint it. I chose the sugar skull box and was really excited about all of the colorful possibilities. We went back to our table and Sylvia came over to explain the painting process to us, offering tips and advice on everything from how to get the best finish, to how to clean up a mistake. She was super patient and answered all of our questions. I had a lot of questions. All. Day. Long. She was absolutely wonderful to have in our corner! The ceramic painting process can take anywhere from a half hour to up to several hours, depending on the complexity of the piece and your artistic dedication. We started painting a little after 11:00 am and had planned on making our way home at about 1:00pm since Starlight had to work. It wasn't long before she realized her crown jewel box had a lot of lines and detail that would take longer than anticipated to complete at her current painting pace. Meanwhile, I had decided that I would recreate my tattoo onto my sugar skull box. That was too overambitious considering I can't even draw a circle. Mine would end up taking a while to complete as well. We talked, painted, laughed and shared stories and food for a few hours. Before we knew it, it was time to get on the road before rush hour. We had spent the entire afternoon at Petroglyph, and finished both of our pieces! 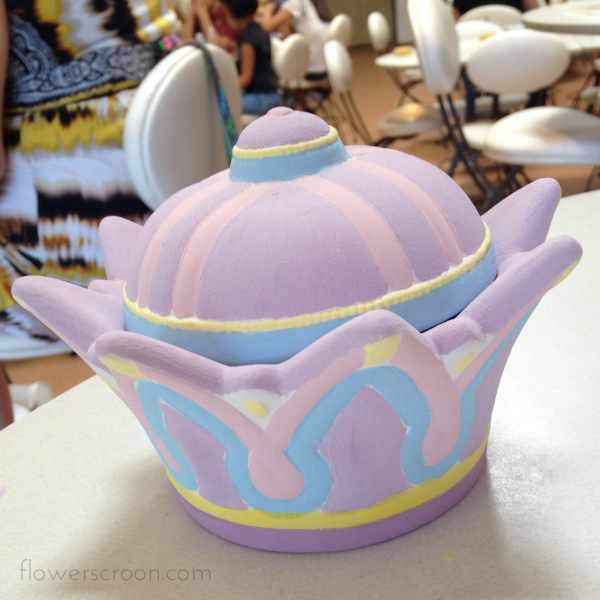 I loved the colors Starlight chose for her crown and was looking forward to seeing it glazed. The raw edges paired with the soft colors gave the crown a touch of her own personality. I had taken on a bit more than I was capable of with the last-minute decision to duplicate my tattoo onto the ceramic, but I had fun with it and really enjoyed the entire process. Sylvia helped me clean up mistakes and start off the piece right with a base coat of white paint. I even managed to sneak in a hidden Mickey. Yesterday afternoon we drove back to Willow Glen to pick up our pieces. We were so eager to see what they would like after being glazed and fired. The results were bold, colorful and fun! We were really happy with what we had accomplished. We are both so happy we decided to spend our day together doing this! It was the perfect combination of shopping, eating, engaging, sharing and being creative. The best part: we only looked at our smartphones to check the time. It was cool to unplug and just hang out. This was exactly what we needed before kicking off the very busy birthday/4th of July weekend. We definitely intend on visiting more often with each other as well as other friends and family. I love that you control the cost based on the items you choose to paint, and I think it's awesome you can bring food and drinks (aka WINE) into the studio to enjoy while you work. Happy 17th Birthday to my sweet baby girl! I'm looking forward to all the minutes and seconds we have together before college.